Iperius Backup is a powerful and reliable software to save your data remotely. It easily allows to make online backups to any remote server, even in parallel mode, with advanced features like bandwidth limitation and secure protocols such as FTPS and SFTP. Iperius is also provided with an professional and dedicated online backup service: Iperius Online Storage. An integrated platform to back up data in the Cloud. Thanks to the FTPS protocol, it is possible to make automatic backups to a remote space from 50 GB up to 3 TB, with the highest security available. Iperius supports incremental backup. This means that, once you completed the first full backup, the next backup tasks will be extremely faster, because only new or modified files will be transfered again. The FTP backup to Iperius Online Storage also supports zip compression and AES 256 bit encryption, ensuring at the same time data saving, performance increase, and the highest security level. 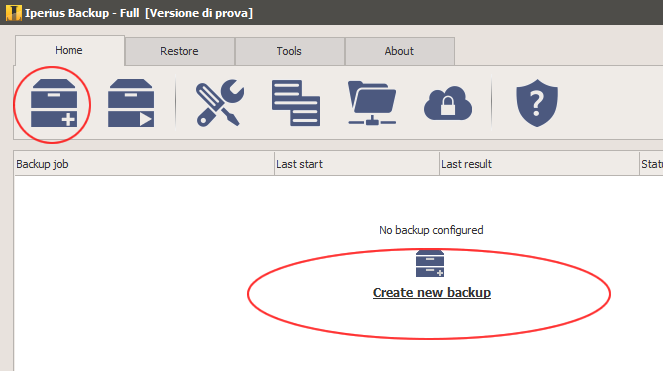 Lets’ see now the few simple steps to make a backup to Iperius Online Storage. In the first panel, “Items”, add the files/folders you want to transfer. You can select an unlimited number of folders and, for each one, set up advanced filters to exclude specific folders or files, also based on their size/extension. You can also add advanced backup types, such as database backup. In the next panel (“Destinations”), we will add the Iperius Online Storage destination. Go back to the configuration of the destination, where you can select, from the drop down list, the account you’ve just created. Below you can set a specific subfolder on the FTP server and the incremental backup type, also choosing if keep more than one copy. In the “Zip Compression” panel you have another important option. In fact, by default Iperius transfers all the files directly and one-by-one, keeping their original directory structures. This allows to make incremental backups and an higher restore speed. However, there could be cases when we need to transfer big files that must be compressed, or files containing sensitive data that we want to encrypt for a better security. In those cases we can set the zip compression and, optionally, password protection or encryption of the whole zip file. You can create unlimited backup jobs, so you can have a backup job that makes an incremental backup and another one that compress and encrypt your files before sending them to the server. These backp jobs can be also executed at the same time (parallel execution). In the “Options” panel, Iperius allows to set the Synchronization (checking this option Iperius will automatically delete from the FTP server those files no more existing in the local folders), some options to improve performances (like that one to use multiple connections), the creation of specific subfolders and the bandwidth limitation. This last option is very important, because we can avoid consuming the whole internet bandwidth with backup processes that could need a lot of time. We now completed the configuration of source folders and remote destination. Every backup job also allows to set some specific options, among which scheduling (for automatic execution), e-mail notifications and execution of external scripts. In the final panel, you must specify a name for the backup job and then click on the OK button to save it. To restore files from Iperius Online Storage, the fastest way is to go in the destination panel, right-click on the destination and then on “Explore path”. Iperius will open its FTP Client, that will allow you to browse remote folders and download files or folders in the easiest way possible. Thanks to its flexibility, ease of use and completeness, Iperius can be considered in most aspects the best software to make remote FTP backups. We must also remember the Iperius FTP functions can be used to automatically update websites or to download entire websites locally. The remote backup to Iperius Online Storage can be used starting from the Desktop edition (for workstations) at only 29 euro, and at only 69 euro (Essential license) for servers. The remote storage space is available at a very convenient price, starting from 39 € for 50 GB. Iperius Online Storage is a cheap and very reliable solution to save your important files remotely. a auto FTP backup (every 24h) to from my storage to yours. you can schedule a backup going to the Scheduling panel inside the Job and checking the execution time and date, for example Each 24 hours. 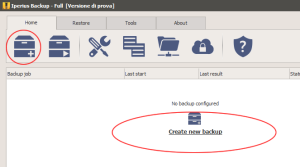 the Synchronization option doesnt work if you select to zip the backup file.